Little corners are important! Did you know that? 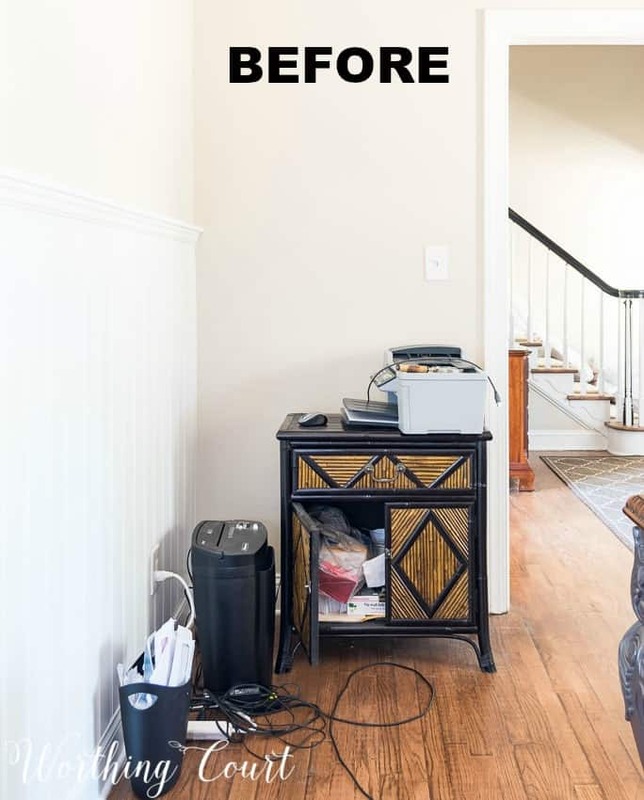 During our office makeover, I’ve discovered just how important a small spot can be when it comes to making a room functional. Let me explain. Our office is technically the living room in our house. It’s right off of the foyer, so there’s no way that you can miss it when you enter our front door. It isn’t very large, so any furniture has to be functional as well as attractive. And that my friends, can be a challenge! Our desk floats in the middle of the room, facing the windows that look out over the front yard. I needed a piece of furniture that would comfortably fit in the small corner beside the desk. Something that would hold our printer and all of the office and bill paying paraphernalia. This is what we’ve lived with since we moved in two years ago. A hot mess of a tiny cabinet that has a door that won’t stay closed. A drawer that almost falls out every time you pull it open. Wires and more wires everywhere. Ugly and annoying. No denying that we needed a much more functional (and better looking!) piece of furniture. So began the search. 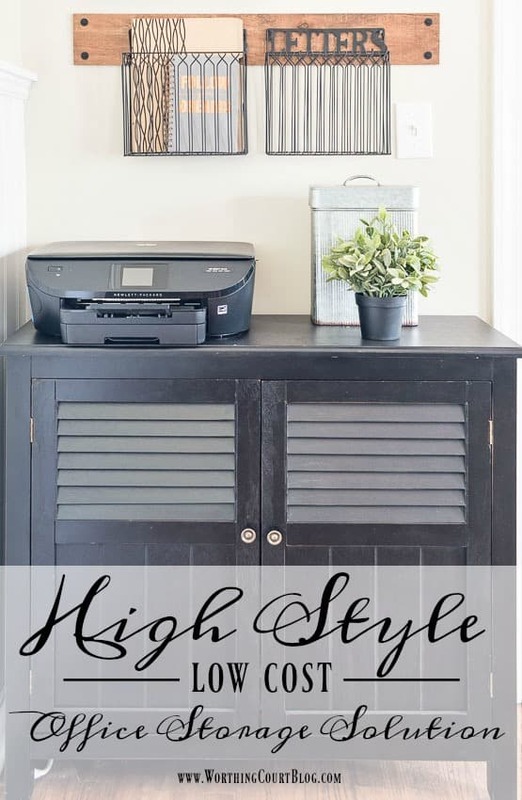 I had three requirements: 1) nothing dinky – it had to be wide enough and tall enough to fill the corner, 2) it had to be deep enough to hold the printer, yet slim enough to fit in the tight space beside the desk and 3) it had to be stylish, but very affordable. 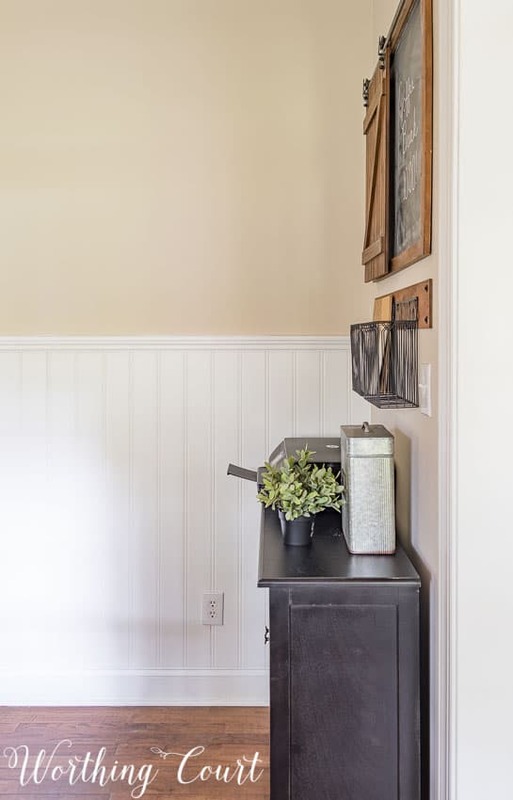 Oh – and it had to be something that would express the farmhouse, slightly rustic and slightly industrial vibe that I was going for in the office. It can be hard to find just the right thing when you’re searching for something with such specific requirements! So, I headed straight to my local At Home, The Home Decor Superstore. With their everyday low prices, I find myself frequently shopping there. They have such a great selection of every kind of on-trend, designer decor I could ever need for any room in my house – lamps, vases, furniture, textiles, housewares, patio and garden, rugs and seasonal. Plus, they add over 500 new items every week- wowza! As I was shopping the aisles of At Home, I ran across just the right thing! This chest filled all of my “looks” requirements and was the right depth, width and height that I was after. Plus, it had a shelf behind the doors that would allow me to store and organize all those pesky office supplies. 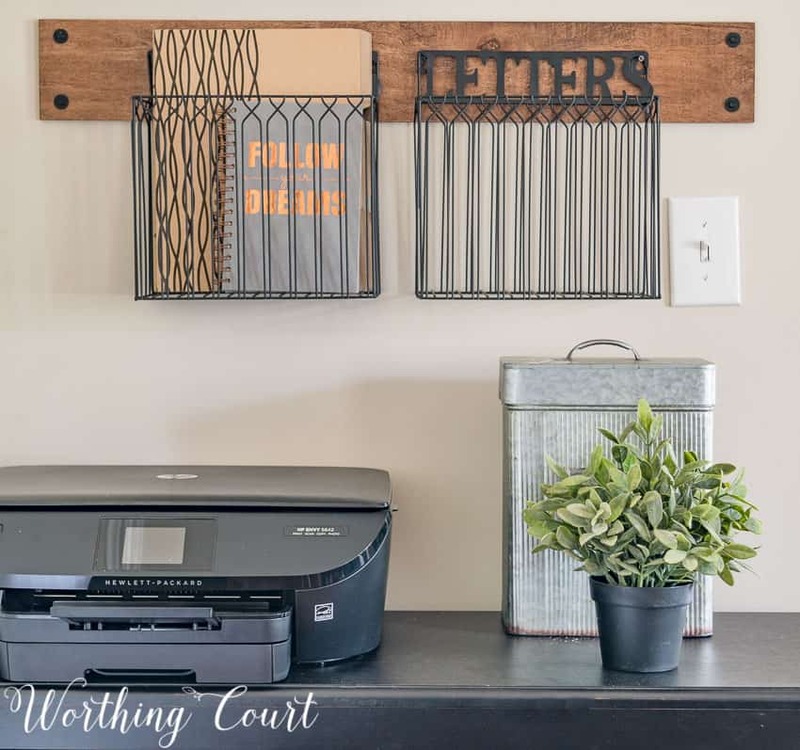 I wanted to dress up the wall above it too, so I picked up two hanging wire baskets, from At Home’s wall decor department, that I could use to hold bills and other assorted pieces of mail. I left one of them empty so that you see that each basket has the word LETTERS across the top. 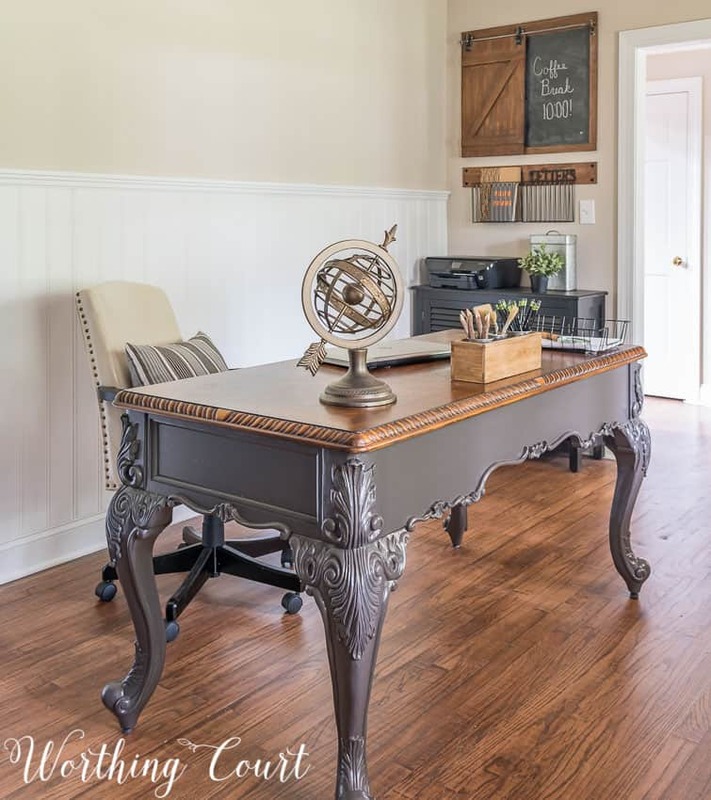 Perfect for our home office! To help it all blend together, I mounted the baskets on a scrap piece of wood that I stained. To reinforce the industrial vibe even more, I attached the board to the wall using black screws and washers. From this side view, you can see that the slim profile of the chest doesn’t impede on the walkway at the side of the desk at all. Perfect for this tight spot! Here’s a tip for you: when shopping for something specific, make sure you take measurements with you!. I carried our printer measurements to At Home with me, to make sure that whatever I purchased would work. Now I no longer have to be embarrassed by the junky looking small chest that struggled to work for us! Do you have any specific furniture pieces that you’re searching for? If you aren’t quite sure what you want, click HERE to find tons of inspiration and ideas on the At Home website! Beautiful and perfect x 1,000!!!! 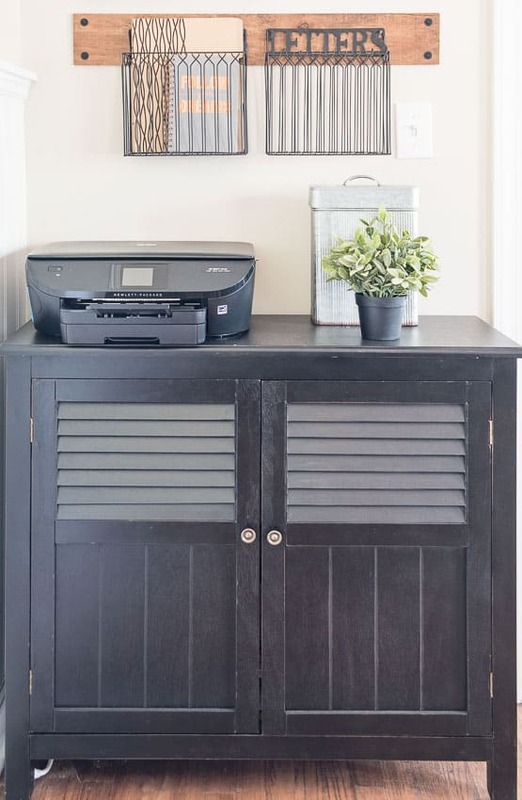 I love this look – and I really appreciate the Home store link! 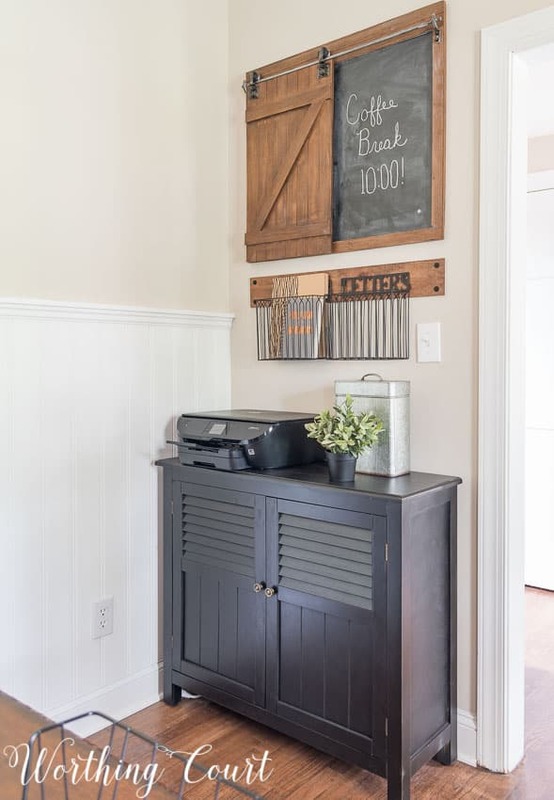 I NEED that barn door chalk board in my life!!!!! My entire office/guest room is a mess! ugh. I panic when there are guests coming. Like next weekend is looming. Eeks! But what about that AMAZING chalk board? It’s a great day when you find exactly what you need. I love the way you’ve brought in different design elements, and they all work great together. I LOVE your desk. Would you share where you found it? Hi Jeannie. We bought the desk about ten years ago at a local furniture store. In case you didn’t see my previous post, I recently painted the legs. Thank you so much for that information, Suzy. I did indeed see your previous post, and I love the color you chose for the desk. I’m on the hunt for a desk and yours is the style I’m looking for. I love the whole look – very well done. I’m going to pin it. Like others, I’m wondering about that cute blackboard. Your office is looking great! I love your desk. Just yummy and perfect for that spot! I love the chalkboard. Did you make this or purchase it? What a great idea. Wow so much better, the new look is fantastic, streamlined, and clutter free. You must love it every time you walk by? Great before and after. Fabulous before and after, looks great! 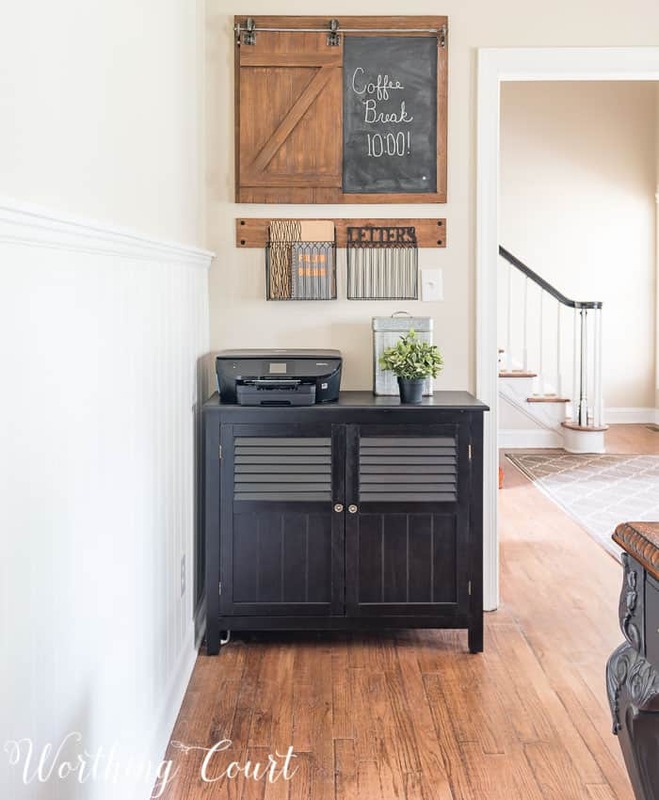 love that chalkboard! thanks for sharing on craft schooling Sunday, as always! What a desk! That is so gorgeous. And the printer table is perfect accompaniment. Love the things you added to the wall too! Suzy, I LOVE this space and pinned for my hubby down the road. Love some of your ideas. Thanks for the inspiration. I think it looks perfect how it is but you are going to make the right choice. That desk is beautiful! I look forward to spending more time on your site! Blessings! I am in love with the chalkboard!! Beautiful! Wow! What a perfect fit! And it met everything you were looking for~I’d say it was well worth the wait. What a difference it makes! The whole room looks absolutely stunning!! I really like that storage piece. Thank you for the great tips and the inspiration!! Great ideas adding the baskets mounted to a board. That is a good idea!